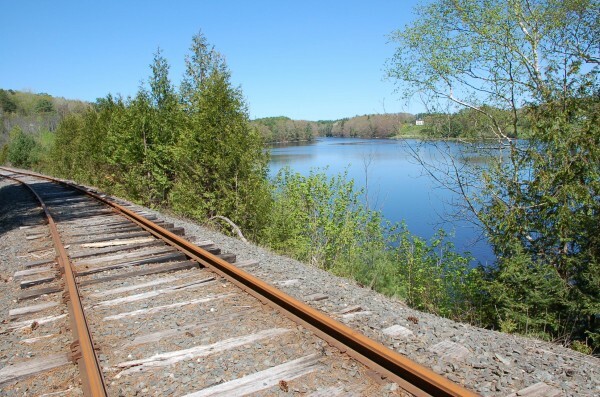 A view looking north along the former Belfast & Moosehead Lake Railroad line. The Belfast City Council is considering building a pedestrian walkway along the rail line. A view south along the former Belfast & Moosehead Lake Railroad line. The Belfast City Council is considering building a pedestrian walkway along the rail line. A map showing the proposed walkway. 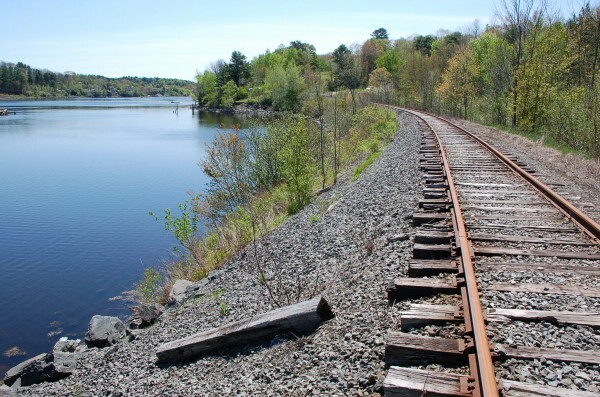 BELFAST, Maine — A plan to develop a pedestrian trail along the former Belfast & Moosehead Lake Railroad right of way will be presented to the city council Tuesday night. Public sentiment is being sought on the project at the meeting as a necessary step before a final plan is presented to the council, probably in March. The plan that goes before councilors Tuesday is a draft, but some key decisions have been reached, and councilors will see some definitive cost numbers that likely will guide their conclusions about how to proceed. Assistant Planner Jamie Francomano said Friday that the plan to build the pedestrian walkway does not mean permanently closing the door to railroad use of the three-mile strip of land. He acknowledged that the best and highest use for the corridor, which follows the Passagassawakeag River from the harbor in a northwesterly direction, is for a railroad carrying freight or passengers. The draft plan suggests either paving the railway or covering it with gravel. Paving the entire corridor would cost $500,000, according to the feasibility plan by Vanasse Hangen Brustlin, Inc. Using gravel to cover the tracks and create a walking surface would cost $100,000, the engineering firm concluded. The total cost of the project, according to a memorandum Francomano has given to councilors, is between $510,000 and $1 million. Councilors have indicated that they will not pursue another option, which would have built the pedestrian walkway next to the tracks, thereby allowing trains to continue to use the corridor. That option would cost five times as much as the paving and gravel options, he said. Francomano also argues that paving or putting gravel over the tracks, ties and stone base would preserve the corridor for future rail use. “Capping it is better than doing nothing,” he said, because it would stabilize the bed. The city purchased the right of way from the Unity Foundation in 2010 for $200,000. A volunteer-run nonprofit group, the Brooks Preservation Society, has been running passenger excursions along the line in the warm months. If the pathway is built, that group would still be able to use the 30 miles that runs northwest through Brooks, Unity and ending in Burnham, if the rail meets federal safety standards. Francomano said the city recognizes the revenue the volunteer group brings into the area with the train rides, and hopes it can thrive with a more permanent base, perhaps from a private railroad siding on Upper High Street near the Kaler Road intersection. The report points out what it calls barriers at either end of the proposed walkway. Near the harbor, the city’s control of the corridor ends at the Penobscot McCrum plant just north of the footbridge, making it challenging to connect the rail walkway with an almost-completed harbor walkway. The draft plan suggests that a series of switchbacks could allow pedestrian to access the trail by descending the steep grade below River Avenue, but the report estimates the cost of that work at $400,000. At the northern terminus, near where the rail line crosses Upper High Street/Oak Hill Road, the plan shows several options: following the rail line, veering off to the west and veering off to the east. The costs of each vary from $10,000 to $100,000. 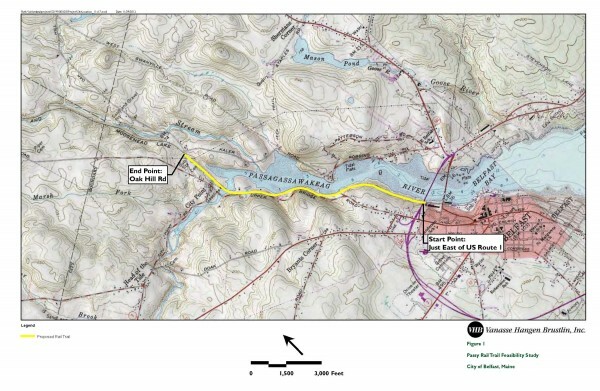 No funding sources have been identified for the rail trail, Francomano said, adding that it is possible for the project to be completed in phases over several years.